The Scaife Mountains is a group of mountains rising west of Prehn Peninsula and between the Ketchum and Ueda glaciers, in Palmer Land, at the base of Antarctic Peninsula. Wetmore Glacier is a glacier about 40 miles (64 km) long, flowing southeast between the Rare Range and Latady Mountains into the north part of Gardner Inlet. It was discovered by the Ronne Antarctic Research Expedition (RARE), 1947–48, under Ronne, who named this feature for Alexander Wetmore, Secretary of the Smithsonian Institution, who assisted Ronne in laying out the scientific research program of the expedition. Irvine Glacier is a glacier, 40 miles (64 km) long, draining southeast between the Guettard Range and the Rare Range into the northern part of Gardner Inlet, Antarctica. It was discovered by the Ronne Antarctic Research Expedition (RARE), 1947–48, under Finn Ronne, who named it for George J. Irvine, of the Engineer Depot at Fort Belvoir, Virginia, who outlined the RARE photographic program. Cole Peninsula is a peninsula, 24 kilometers long in an east-west direction and 13 kilometers wide, lying between Cabinet Inlet and Mill Inlet on the east coast of Graham Land, just east of Thuronyi Bluff and immediately north of the Antarctic Circle. 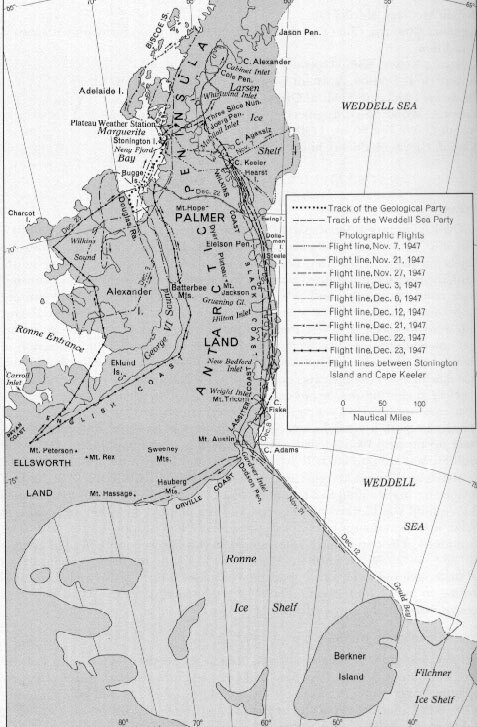 The peninsula is surrounded by the Larsen Ice Shelf, which is part of the Weddell Sea.